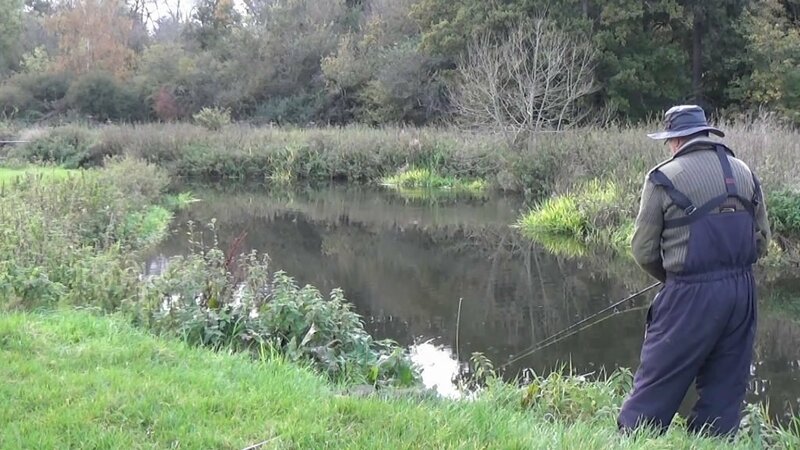 My favourite time of year for hard lure fishing is in the autumn, while the water still has some warmth and the pike are active enough to chase a lure. Fortunately there has not been much rain so far this autumn, so the water is still quite clear which is good for lure fishing. There is still quite a bit of weed although it is breaking down causing quite a blizzard beneath the surface. The weed won’t be completely gone until after floods, so hopefully in the new year the river will be clear of weed, but for now I will just have to try to avoid it. While the river is still weedy, I will stick to floating lures that run shallow or perhaps just through the tops of the weed. 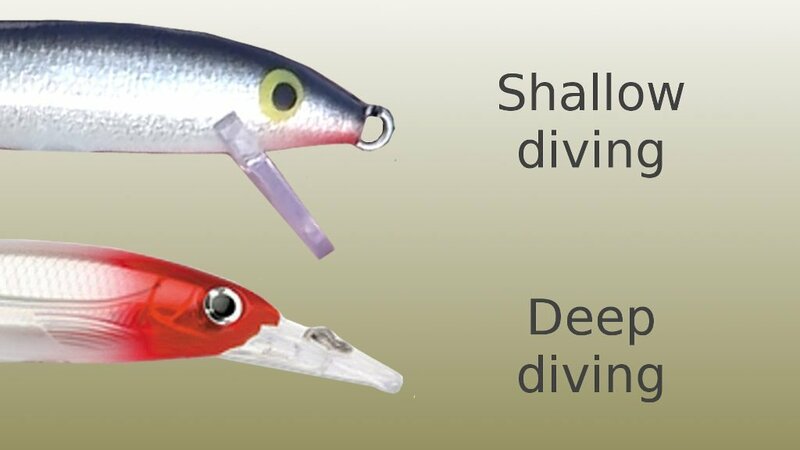 As with most hard lure’s there are two main ways to retrieve. A simple straight retrieve which will cause the lure to wobble as it’s pulled through the water. Or a twitching retrieve making the lure dart from side to side to catch the pikes attention. 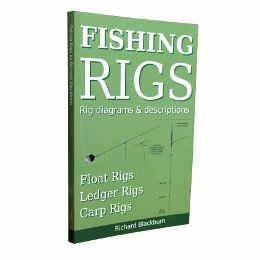 The straight retrieve is pretty much as you would expect, reel the lure in holding the rod steady. The vane on the front of the lure will pull the lure under and cause it to wobble as it’s pulled through the water. You should be able to feel the lure wobbling through the rod. The angle of the vane on the front of the lure helps it to dive, the shallower the angle of the vane the deeper the lure will dive. The twitching retrieve is used to impart a darting movement into a hard lure. 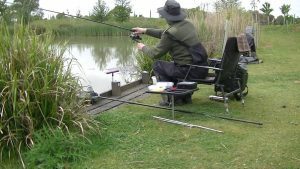 A darting lure action can often provoke a reaction from the pike, but there is a knack in getting the lure to dart around. Twitch the rod tip back while reeling the lure in. The twitches should be along the same path as the line, any sideways movement of the rod will just be wasted energy. 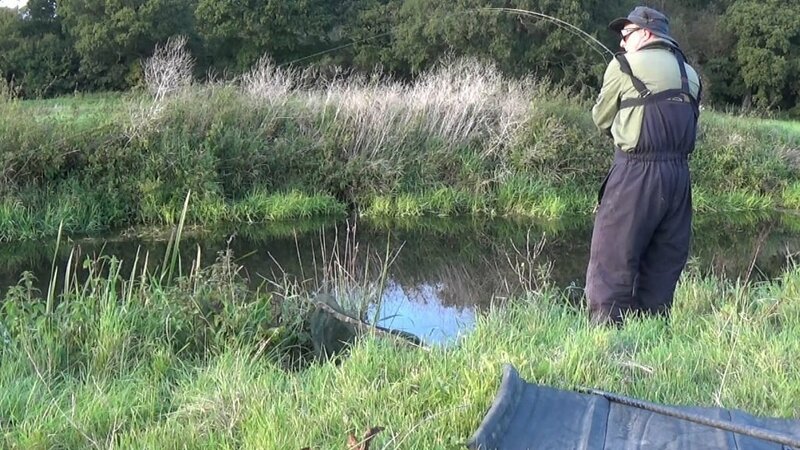 The line must be given slack for a split second to allow the lure to swerve and dart, this happens as I move the rod back before twitching again. Most hard lure’s can be twitched, some are easier than others and some are designed to twitch. Walk the dog lures are designed to dart back and fourth, the Rapala X-Rap SubWalk being a good example. 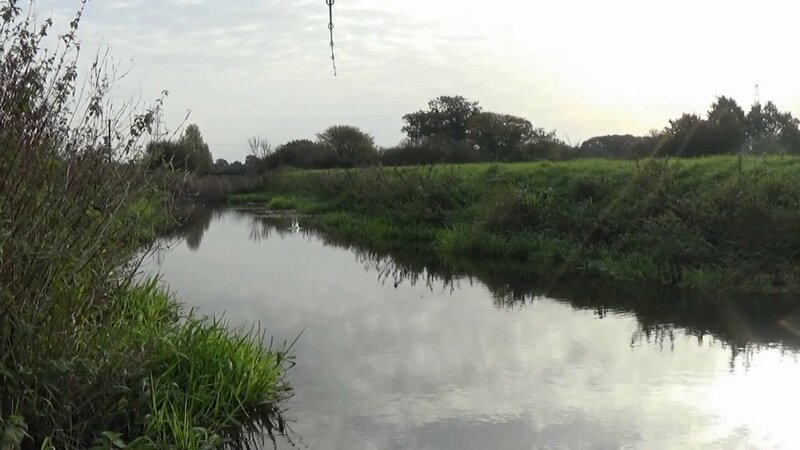 This subsurface walk the dog lure, is a slow sinking variety designed to fish just below the surface, which is great in a weedy river. This time of year I fish either in the morning or late afternoon to sunset. I work my way down the river casting the lure in all the little places where a pike may be. Every spot I try, I will cast four to six times upstream and downstream to cover as much water as possible. 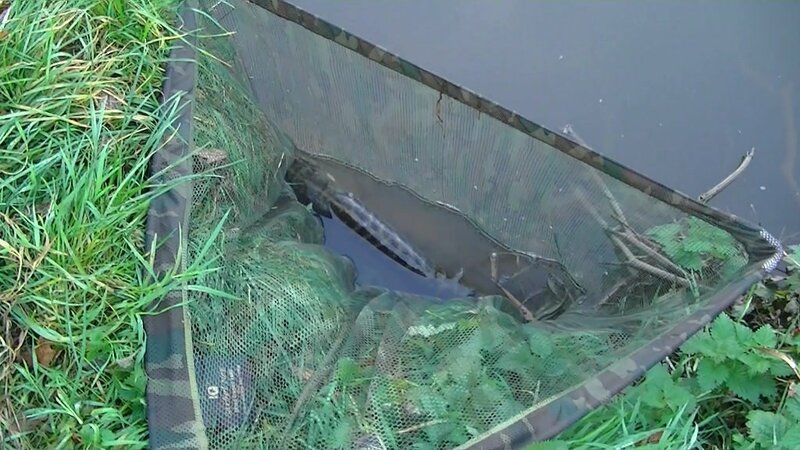 No need to spend too much time in each swim, if the pike are interested they make themselves known. In a weedy river the lure will frequently collect some. The feel of the lure collecting weed is quite different to a take. Weed, twigs and other debris will make the lure feel suddenly heavier. 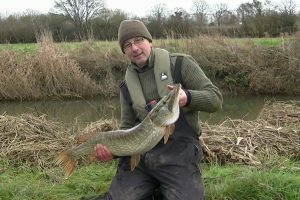 Whereas when a Pike attacks you feel a positive pluck or tug on the line, possibly two or three very quick plucks where the fish bites the lure more than one. Pike can grab a lure, realise it’s not food and let go of it in a split second. So be ready to strike at any time, right up to lifting it out. It’s easy to caught up in the many different colours of pike hard lures. But the profile, size and action of the lure are at least as important. I change the lure regularly until I find the size and profile that the pike will attack on that day. Which could be different from what worked last time. I like to use a lure I think the pike will see as their familiar bait fish, so I use silvery or stripey lures most of the time. To be able to cast and twitch a lure properly, a rod designed for lure fishing is best. Lure rods are described by their length, action and casting weight. 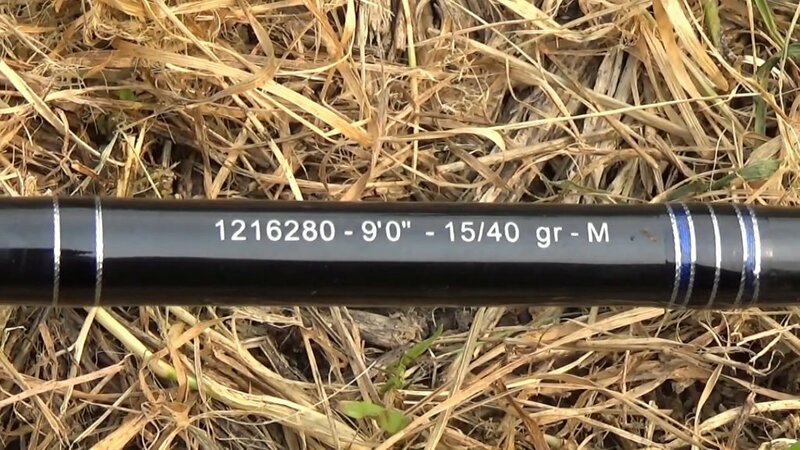 The rod I am using here is 9 foot long, can cast from 15g to 40g and has a medium action. This is my everyday lure fishing rod and the one I use the most. Lures are described by their length, weigh, colour and whether they float or sink. The reel is just a standard fixed spool reel loaded with 30lb braid. The trace is 24 inches long made from 20lb wire which I twist up myself. 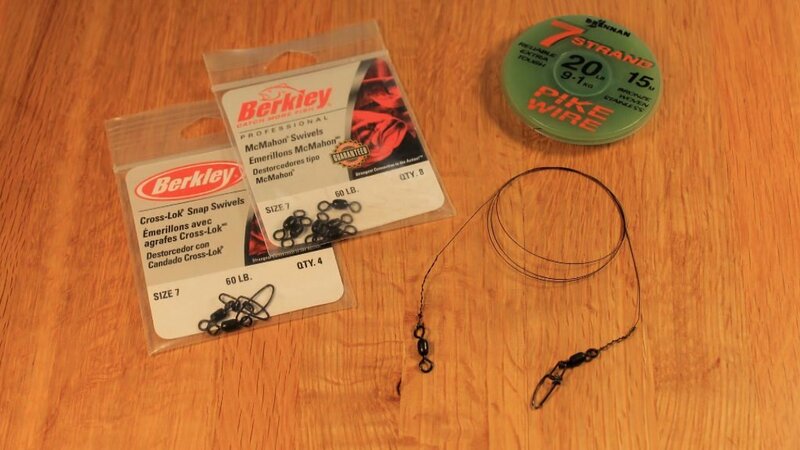 I use size 7 swivels and links rated at 60lb. You can buy ready made traces, but they are usually shorter. Weather conditions play a big part in deciding if I should lure fish, or use a different method. Ideally, I like the river with some flow on a cloudy day with perhaps a recent increase in temperature. If the weather has been poor or I expect the water to have high turbidity, I will probably use a dead bait. 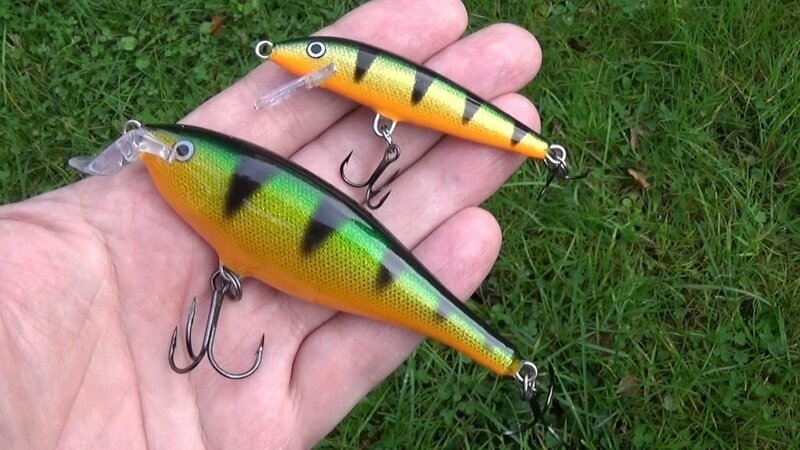 With lure fishing you can catch all sizes of pike from small jacks up to decent fish. It’s just a matter of finding the right lure on the day and sticking with it, best of luck.